Traditionally, development models in Bangladesh have been based on formulas prescribed by international entities in which the focus has been on improving the financial condition of the individual. Which is why micro-credit has been the centre point of many development activities. Ubinig, a research organisation established in 1983, was the first attempt to deviate from the conventional direction of development and provide an alternative that it says is more in tune with the country's needs. 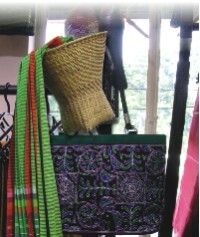 In 1989 Ubinig established Prabartana, a sister concern that promotes indigenous methods of farming and weaving and also assists farmers and artisans to market their products.